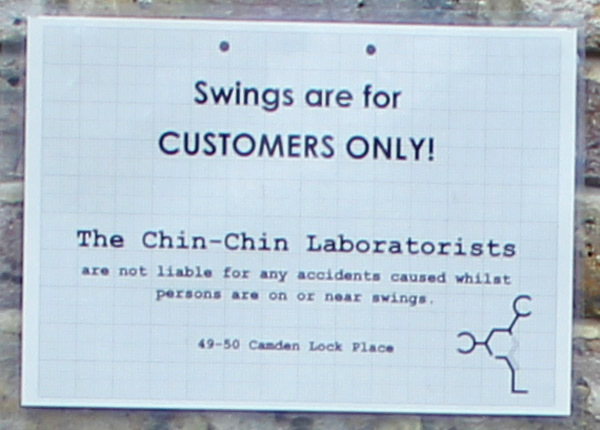 Last week Charles and I paid a visit to the newly reopened Chin Chin Labs in Camden. 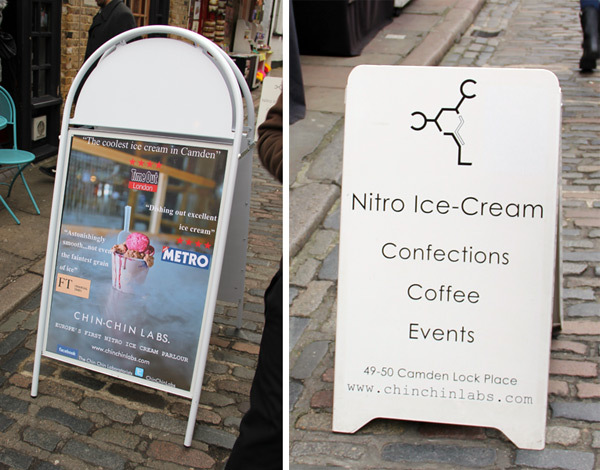 Freezing though it was, how could we not check out Europe’s first Nitro ice-cream parlour? 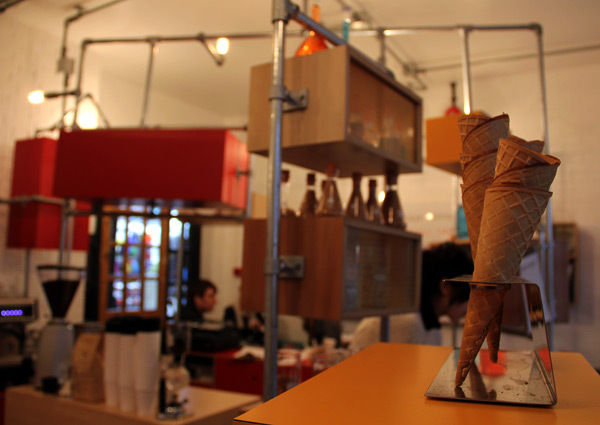 The small Camden ice cream store has received lots of attention from the press for a winning combination of its gorgeous design, theatrical presentation and delicious ice cream. 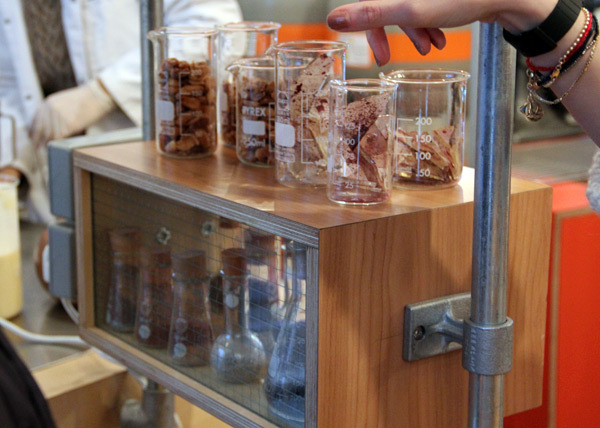 According to the parlour’s facebook page, the laboratorists blend “haute cuisine with performance art in a celebration of gastronomic graphic design”. We had to see what all the fuss was about. Located in the center of Camden Market, on the busy Camden Lock Place, we worried we might struggle to find the shop amidst the sea of tourists. 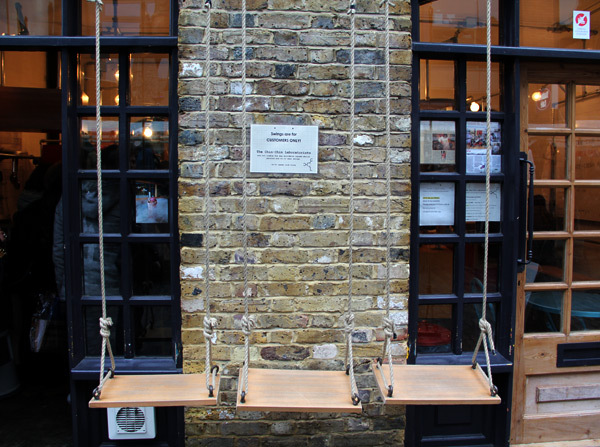 The swings were our first clue that we’d found the right place, as we carefully followed the laboratorists’ directions of “just off Chalk Farm Road; turn left at the iconic Camden Lock railway bridge & lookout for the swings outside the shop”. 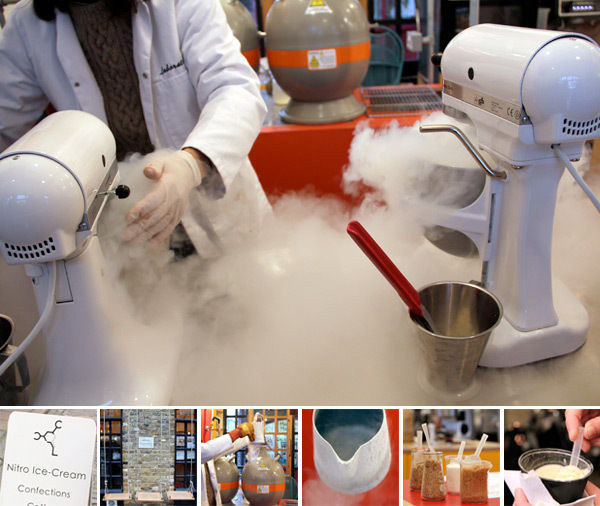 Even in the freezing January cold, a crowd gathered, eager for icecream and the spectacle of its liquid nitrogen fueled concoction. 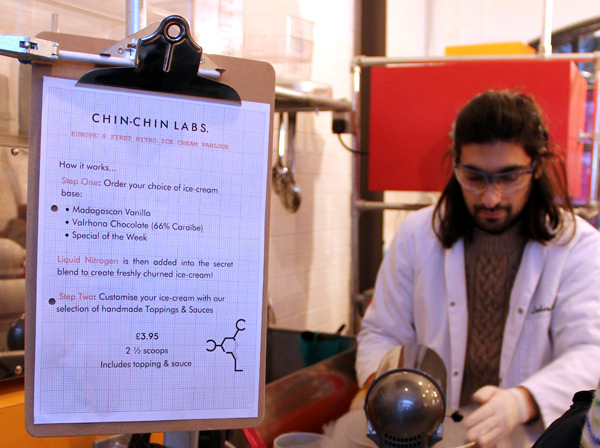 Some seemed to be regulars, while others seemed baffled to encounter a man in a labcoat and safety goggles rather than a freezer full of icecream. The gorgeous parlour was designed by Shai Akram and Andrew Haythornthwaite and is beautifully decorated with a cold industrial almost clinical atmosphere, but kept playful with great use of colors and textures. 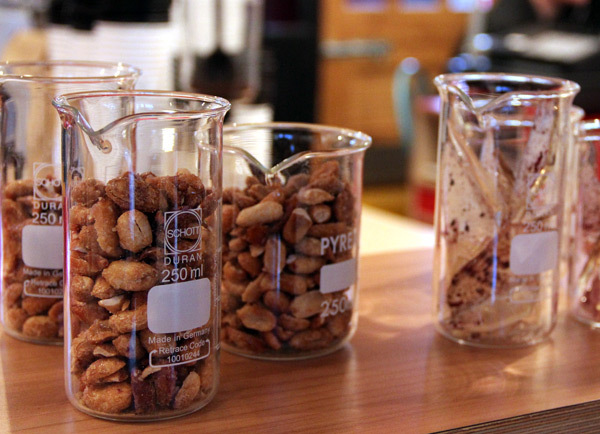 We also loved the use of laboratory glassware throughout the shop, which proved in keeping with the theme as well as stylish and practical. 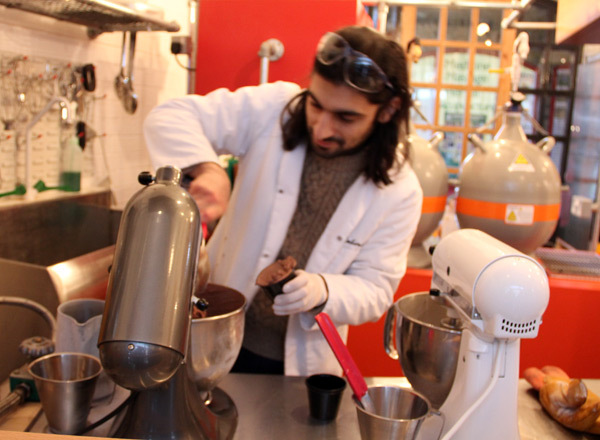 When we arrived, we found a laboratorist in the midst of icecream production, complete with a white labcoat and safety goggles. He assured us that this wasn’t just playing dressup, but really the essential safety equipment required for the job. I wasn’t entirely convinced, but I didn’t quite expect what came next. 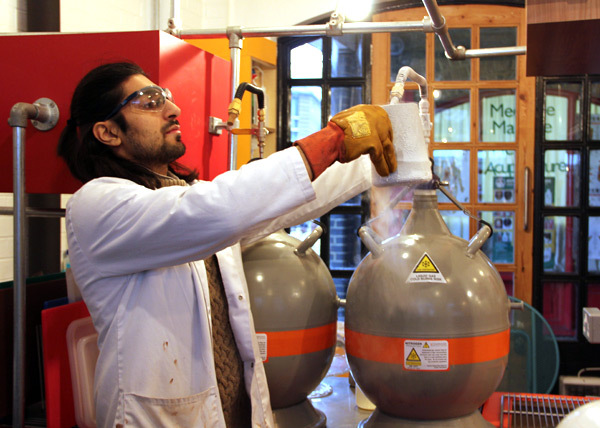 He proceeded to fill a jug with liquid nitrogen, kitted out fully with heavy duty leather gloves. The liquid nitrogen steamed and spluttered and it was clear that the safety googles and lab coat were really not just for show. 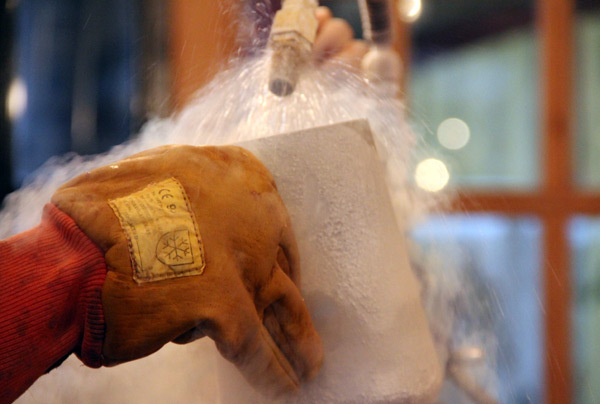 Sure, everyone knows that liquid nitrogen is cold stuff, but it’s no joke at just -346°F to -320.44°F. The frozen jug was certainly a testament to this. 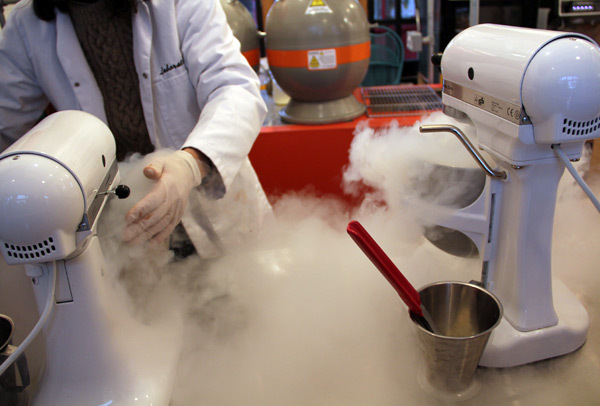 He then added the liquid nitrogen to the cream mix (vanilla in Charles’s case and the weekly special of Vitamin C Orange Creamsicle for me) in the Kitchen-Aid bowls. 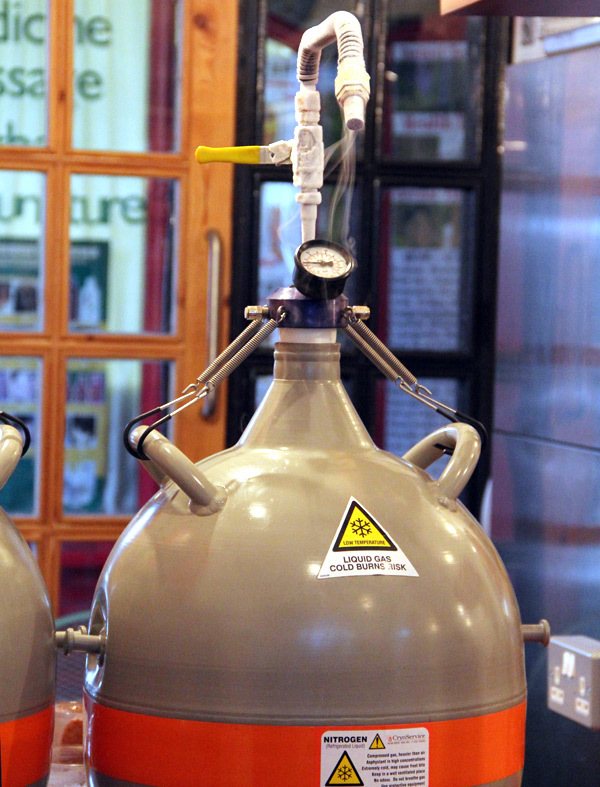 As the blades whirred, steam billowed from the two bowls, like a freezing (and much sweeter) version of a witch’s brew. 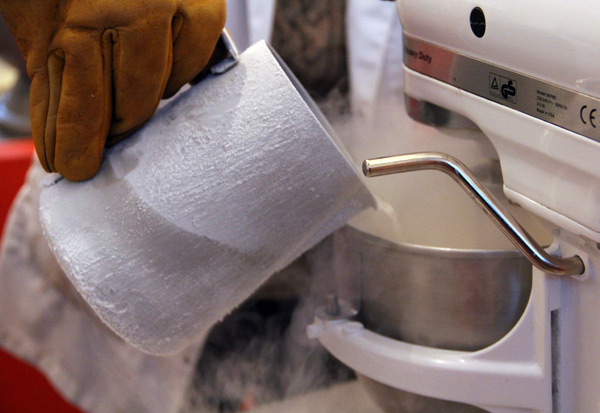 The advantage of using liquid nitrogen as opposed to traditional freezing methods for making ice cream is that the liquid nitrogen freezes the mix so quickly that larger ice crystals don’t have the chance to form, giving the resulting dessert a smoother texture. 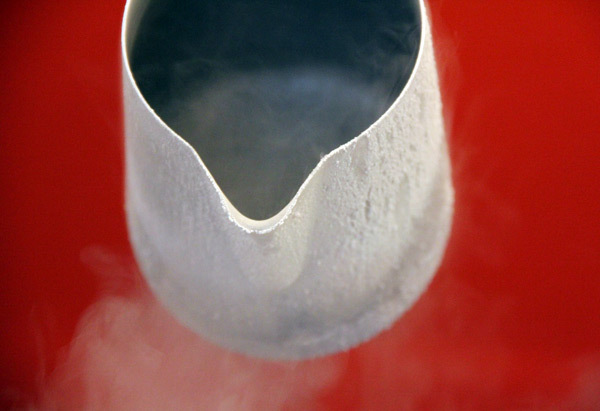 The ice cream also gets colder, more than 10 degrees cooler than your standard freezer’s storage temperature. After our icecream was ready, it was time to pick toppings which included honeycomb, various nuts, violet sugar and even chocolate popping candies. 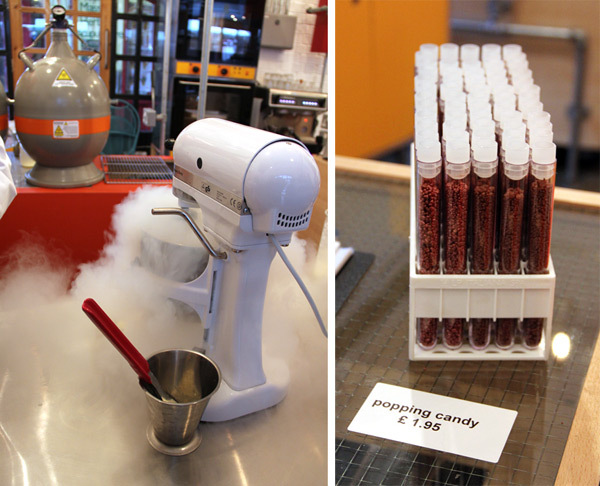 Though I was tempted by the latter, I decided to try my icecream pure, but will have to go back for a taste! Charles opted for toffee sauce and honeycomb. 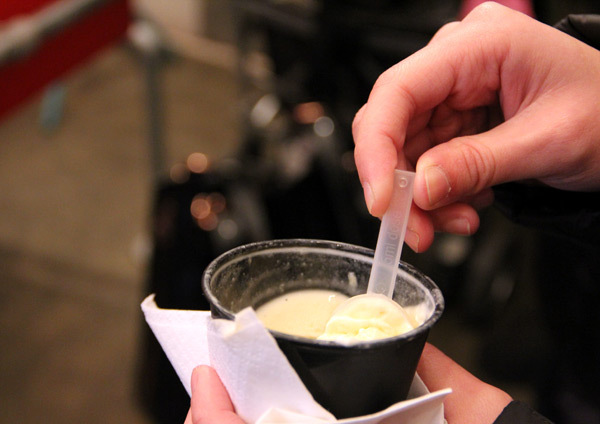 With the spectacle complete, it was time to take a seat and enjoy our icecream, 5mL at a time and it was delicious. My orange creamsicle tasted like a really cold Orange Julius and Charles’s combination of supercold icecream and normally runny sauces was amazing. 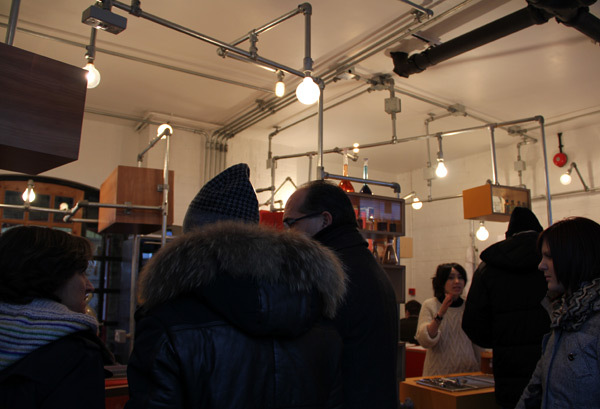 Despite the cold, customers kept coming and we had prime seats to watch the show again. And their tanks were just too cool not to show up close! Wow! So amazing!!!! 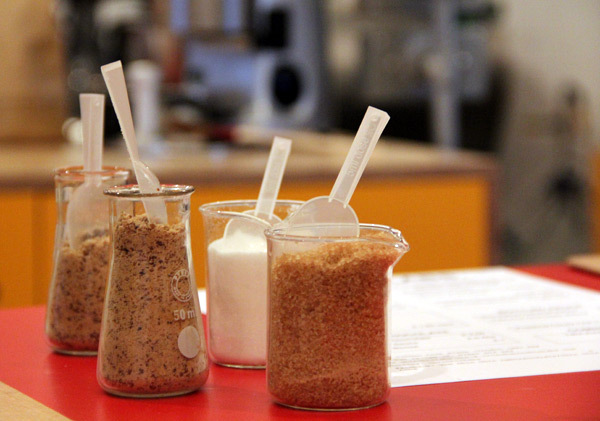 Going into the lab for tasting ice-cream?? That’s really really! I need to visit your shop right now! So neat! Freezing our rears off in the Northeast and that still looks delicious. And fun, I can imagine kickin’ it on a swing with a nitro banana split in hand.